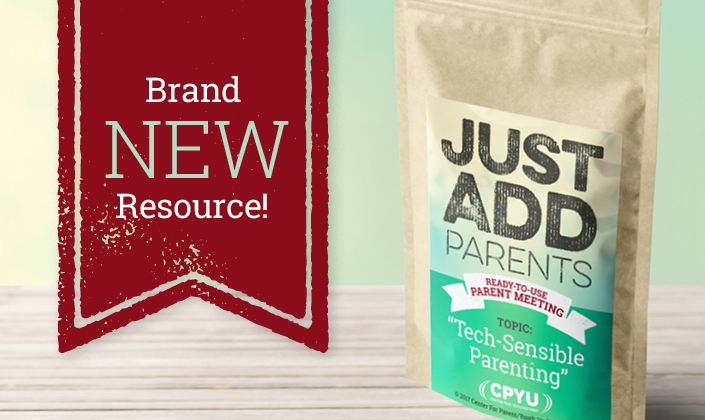 The first installment of CPYU’s Just Add Parents series is now available! We’ve got your parent meeting covered! All you need to do is Just Add Parents. Order today! This product is available as either a digital download or packaged on a physical USB drive. The first installment, “Tech-Sensible Parenting,” is designed to raise the awareness of technology’s life-shaping role for children and teens, inform parents of some of the “danger zones,” and equip them to prepare their kids to engage with technology in positive Christ-centered ways. More installments in the Just Add Parents series will be added in the coming months. Send us your feedback or let us know which topics you’d like us to address in future installments!